Are you tired of trying out different methods of hair removal to maintain your glamorous image? Are you thinking there must be better ways to do it? You can probably list a few of them, but you need more information, because your friends have told you scary stories. You are at the right place. We are here to guide you through the various hair removal procedures, tips and tricks, and best practices that suit different parts of your body. The excess hair on our bodies makes us look ugly. No woman likes to go out with hairy legs or armpits. It takes away that neat and well groomed appearance everyone loves and gives you an unclean and untidy look. For example, if you are wearing a short dress with unshaven legs, it might not look all that attractive to people around you. Something that is even worse is armpit hair. And even if your boyfriend or your husband doesn’t mind hairy body parts, you know it is socially unacceptable to have unshaved legs, or hairy armpits. As it is a well-known fact that most men like well-groomed women. There are dozens of hair removal methods; from natural and organic to clinical and technical. These hair removal methods are applied on parts of your body that contain unwanted excess hair, like the upper lip, chin, arms, armpits, legs, bikini line and sometimes even other parts of your body. The amount and thickness of body hair is different from person to person, based on their body types and hormonal levels. The hair amount, color, and thickness can even change during someone’s life, and various factors can contribute. While some people have thin hair on their bodies, there are certain people with thick and coarse hair all over their body. Most hair removal methods can be performed at home, if you can’t afford a professional. These methods include tweezing, threading, waxing, shaving and the use of depilatory creams. Although these methods can be easily performed at home, the same method carried out at a salon, or a clinic will provide you with better and safer results. Not to mention that some methods are just cumbersome to perform on yourself. Here is a list of the most commonly used techniques to get rid of unwanted body hair. Tweezing is best to be used for small areas in your face since it requires you to pluck out each strand of hair one at a time which is frustrating whereas shaving can easily be used on almost any part of the body, its only disadvantage being the very quick regrowth. Threading is similarly used especially on facial areas like the upper lip and eyebrows. These three methods are lifesavers for people who remember to get rid of their armpit hair or shape their eyebrows at the last minute before going out. If you are one of them, you already know how quick and easy these methods are. Waxing is another procedure everyone loves. It takes time and patience to be carried out but can be done on any part of your body. The last but not least is depilatory creams. These creams can be bought from pharmacies or beauty centers and they use specialized chemicals that make the excess hair fall off automatically after application. Most depilatory creams target less sensitive areas like the arms, legs and bikini line while some can be used on face. These methods are only temporary, and after a certain time the hair is eventually grow back. Is there such a thing as a permanent hair removal method? Yes, there are permanent methods. The two methods of permanent hair removal are electrolysis and laser treatment. Either of the two methods results in permanent, or at least a long term halting of hair growth. The Laser light method can be conducted on any parts of your body. 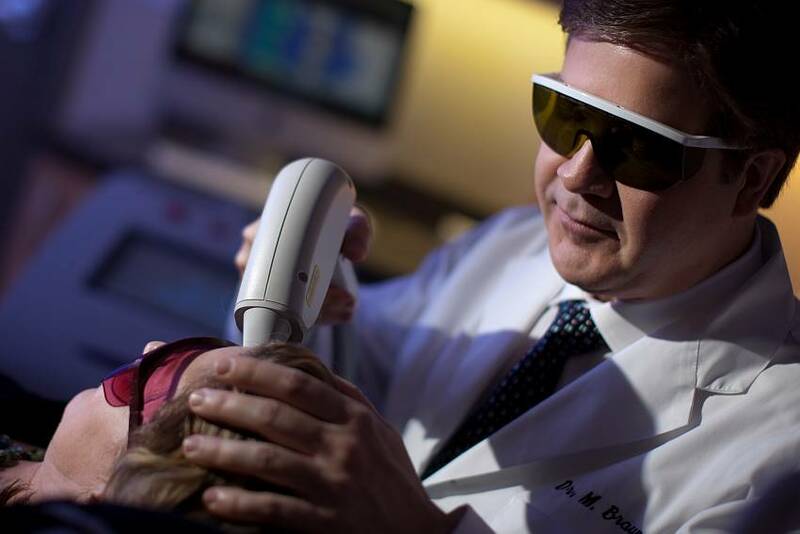 But the major issue is that laser only works on women with white or blonde hair with a light skin complexion. On top of that, it must be performed for a series of 4-6 treatments, and then carried out regularly for a period of time. This means it can be quite costly. But the real problem is that laser doesn’t work on people with dark skin and hair. Is there a method for these people? The simple answer is the electrolysis method. But since electrolysis is an extremely complex, and time consuming procedure, it is usually applied on small areas, such your face. The last two methods are very technical in nature. So trying to do it on your own is not a good idea since it requires special equipment and experience. However, newer equipment has appeared on the market, and it gives pretty good results. But this equipment is for personal use, has less power than the professional one found in specialized clinics. In our opinion these methods should be carried out in a clinic, under a doctor’s supervision. All good things are expensive. So yes, the clinical methods for permanent hair removal also fall into the same category whereas the simple do-it-yourself methods are less expensive. However, if you are concerned about your skin’s safety, protection from infections and other side effects, it is best to always go to a clinic. The professional setup is the best to have your work done, regardless of whether you want a simple waxing or a more complex laser treatment. There are a lot of professional clinics in the Ottawa region, and you can certainly find one that is close to your house, or maybe to work. Prices can be consistently different, so do some shopping before you book your session. For the advanced hair removal methods, make sure the clinic you are choosing has a doctor on site, and has great ratings.